This season’s must-have wardrobe staple is, apparently, the Irish Sibeal Wars T-Shirt. 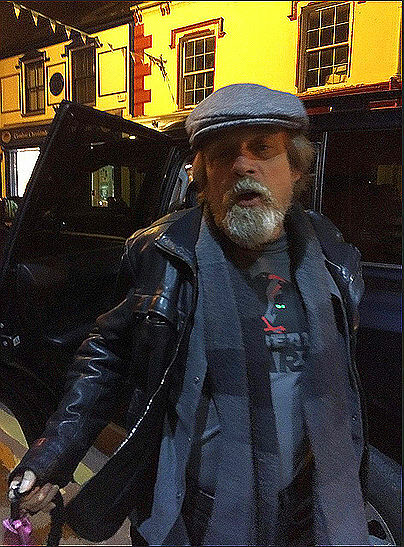 Worn by none other than Mark Hamill, who plays Luke Skywalker in the Star Wars series, the Irish Sibeal Wars T-shirt, is the perfect day-to-evening item. Sling it on over a pair of jeans for filming on the world’s most famous science-fiction movie franchise by day, and then dress it up with a jacket and hat for the Star Wars wrap party in Dingle later than evening. Mr. Hamill looks dapper yet comfortable as he poses outside Foxy Johns pub during the festivities. Designed by Declan Mulvany for SkelligWars.com , the Irish ‘Sibeal Wars’ T-shirt is available from the Irish Pub Shop in Killarney, Co. Kerry. Expand your wardrobe with a selection of other unique designs from SkelligWars including scenes from the spectacular locations of Skellig Michael and Ceann Sibéal. There may not have been a red carpet at Foxy Johns on May 25th, but there was no shortage of celebrities. Locals involved in the construction of the Ceann Sibéal joined Hamill and Daisy Ridley in the pub, where Ridley is said to have pulled pints of Guinness. None of them was better dressed than Hamill, however, who also brought his dog, Millie. The West Kerry shoot was a huge undertaking, involving more than 400 people, including cast, crew and support staff. Film crews reconstructed the 6th-century monastic site from Skellig Michael, which appeared in the final scene of The Force Awakens, on the craggy headland of Ceann Sibéal, further north.